This cat has gotta be one of my favourite MC's right now. Emilio Rojas aka Raks One, Rochester, New York representative, is part of the homie J. Master's Same Plate Management stable, and is most definitely one of the hottest up and coming MC's. His guest verses smash every time without fail, his Phaze One project with M-Phazes is highly anticipated and from the sneak peek we heard, it's off the chain, and to tide us all over, Emilio linked with Legend and DJ Noodles to bring us Recession Proof. 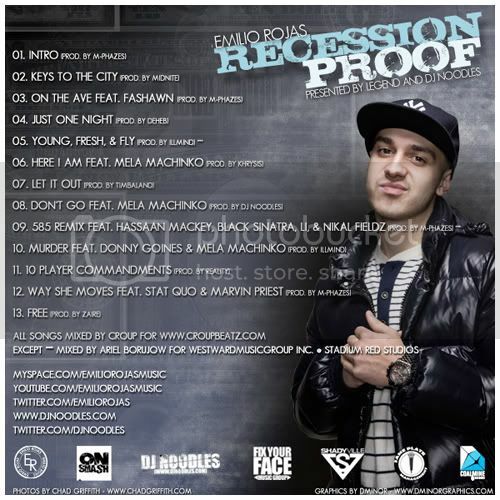 "Emilio Rojas drops his highly anticipated new mixtape “Recession Proof”, presented by DJ Noodles and Legend. 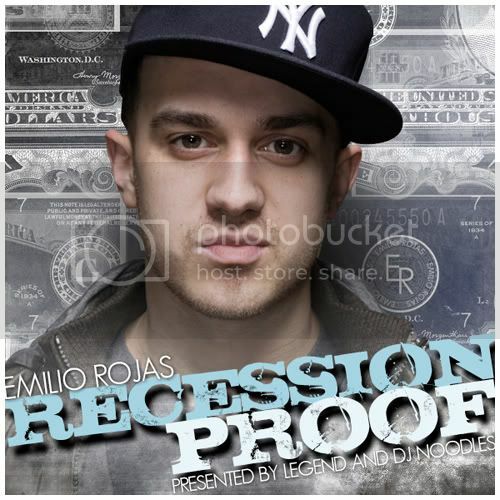 After dropping a slew of singles, popping up on radio shows, a steady stream of live performances, and MTV video play, Emilio follows up with his first official mixtape, featuring appearances by Stat Quo, Fashawn, Donny Goines and more, while Illmind, M-Phazes, Khrysis and others check in on the production tip."